The .300 H&H Magnum Cartridge was introduced by the British company Holland & Holland as the Super-Thirty in June, 1925. The case was belted like the .375 H&H Magnum, and is based on the same case, as also is the .244 H&H Magnum. The belt is for headspace as the cases’ shoulders have a narrow slope rather than an actual shoulder. More modern magnums continue this practice, but headspacing on the belt is not necessary with their more sharply angled shoulders. The cartridge was used by American shooter Ben Comfort to win the 1000-yard Wimbledon Cup Match at Camp Perry in 1935, and it was used again to win the international 1,000 yard competition in 1937. Winchester chambered the Model 70 in .300 Holland & Holland Magnum in 1937. 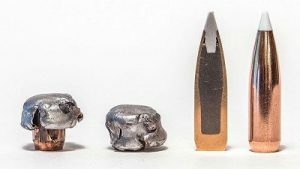 The cartridge offered superior ballistics to the .30-06 for long range, and the .300 H&H is almost as versatile with all bullet weights and types, especially if well-developed handloads are used. It excels with the heaviest .30-calibre bullets in the 180–220-grain range. It has never been as popular as the .30-06; but the mystique of well-crafted rifles chambered for the .300 H&H keeps the cartridge in use despite its repeatedly reported demise. The .300 H&H is a fine African plains game cartridge, and suitable for all but the most dangerous big game. 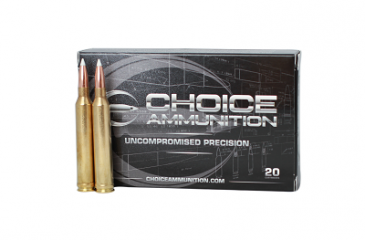 Choice Ammunition has taken our 100% hand-loading techniques and produce an extremely accurate, highly dependable round for the .300 H&H in this load. Our loading tolerances are only matched by passionate hand-loaders in their own loading rooms. Consistent seating depths, powder charges and proprietary formulas of Choice Ammunition, make this 180 grain Barnes Tipped Triple Shock (TTSX) round the best you can buy on the commercial market today. .300 H&H Magnum 180 grain Nosler AccuBond- The .300 H&H Magnum Cartridge was introduced by the British company Holland & Holland as the Super-Thirty in June, 1925. The case was belted like the .375 H&H Magnum, and is based on the same case, as also is the .244 H&H Magnum. The belt is for headspace as the cases’ shoulders have a narrow slope rather than an actual shoulder. More modern magnums continue this practice, but headspacing on the belt is not necessary with their more sharply angled shoulders. The cartridge was used by American shooter Ben Comfort to win the 1000-yard Wimbledon Cup Match at Camp Perry in 1935, and it was used again to win the international 1,000 yard competition in 1937. Winchester chambered the Model 70 in .300 Holland & Holland Magnum in 1937. 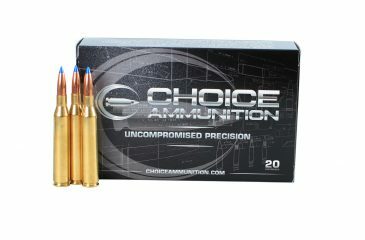 Choice Ammunition has taken our 100% hand-loading techniques and produce an extremely accurate, highly dependable round for the .300 H&H in this load. Our loading tolerances are only matched by passionate hand-loaders in their own loading rooms. Consistent seating depths, powder charges and proprietary formulas of Choice Ammunition, make this 180 grain Nosler AccuBond round the best you can buy on the commercial market today.